As a black, female artist in the 1960s, Ringgold says there were "a lot of people trying to get in my way and keep me from doing what I was doing." Above, a 1965 self portrait. 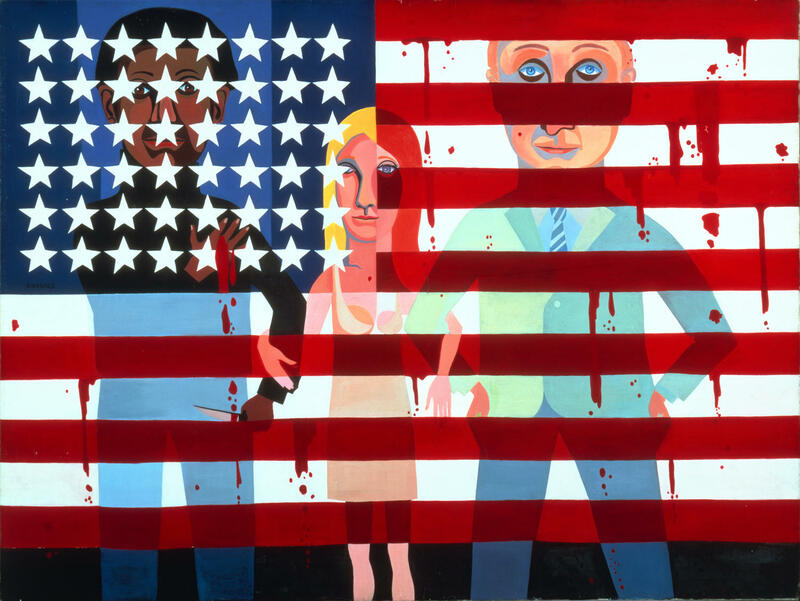 In 1963, Faith Ringgold began a series of 20 paintings called "The American People." She she wanted to create images that would make people really look. "The more they look, the more they see," she says. Above, #18: The Flag Is Bleeding, 1967, oil on canvas. "It was what was going on in America and I wanted [viewers] to look at these paintings and see themselves," Ringgold says. Above, American People Series #20: Die, 1967, oil on canvas. "People like stories," says Faith Ringgold. "I think I ... struck on a combination of imagery and politics that worked." Faith Ringgold is now 83 — and still stunning with her long braids and colorful beads. "[It] was important to be determined," she says of her time developing as an artist in the 1960s. The stop signs that appeared in the pop art movement spoke to her: "There were a lot of stop signs in my life. ... People telling you what to do, when to do it, and so on," she says. In the '60s, those days of civil rights struffles and conflicts over equality of ther aces, Ringgold was making traditional art — painting landscapes primarily. She showed her work to Ruth White, the owner of the popular Ruth White Gallery, who said Ringgold couldn't be black and simply paint landscapes during such a tumultuous time. "Some people might have been upset or hurt by it," she says. "But I was happy that she had the courage to tell me that. " So Ringgold changed her work; gave up landscapes and began putting on her canvases the racial and political tumult of the '60s — and the rage she often felt. In 1963, she began a series of 20 paintings called "The American People," which depicted confrontations between white and black people. Her 1967 painting Die shows a violent street riot. White and black faces peer through bloodied stars and stripes in The Flag Is Bleeding. "It was what was going on in America and I wanted them to look at these paintings and see themselves. ... I wanted to create art that made people stop and look.You've got to get 'em and hold 'em: The more they look, the more they see." Ringgold wanted us to look at the realities of race in this country — the pain and brutality of it — but she found no ready audience. She says it's taken 50 years to get these tough paintings exhibited. Part of it, she thinks, is because she was showing "too damn much" back then. "You can get by very easily without saying quite so much," she says. This led Ringgold to create the story quilts for which she became known. At first, she thought they wouldn't be embraced as art because quilts are traditionally thought of as a craft, but the opposite happened: "Paintings, people really don't understand. ... They don't really get paintings. Quilts they do understand because everybody has a quilt in their house." She thinks it had to do with the comfort and familiarity of the medium. "People like stories," she adds. "I think I had struck on a combination of imagery and politics that worked." These days, Ringgold makes successful children's books and is working on a new project in which she turns Sudoku into art for smartphones. 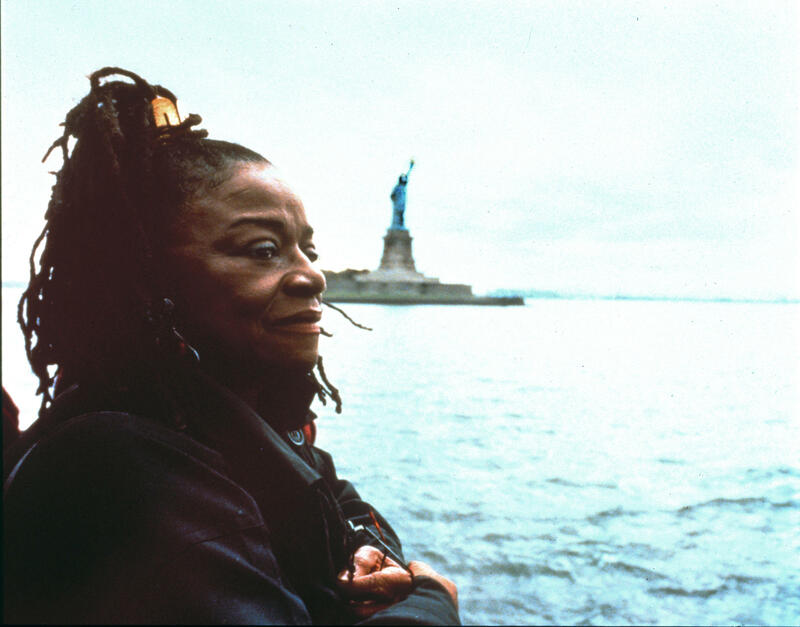 As for the emotion that inspired her earlier work, Ringgold says it wasn't really anger — it always came from a place of enlightenment. "I don't think you can create art out of anger, it has to come out of some form of understanding," she says. "You have to feel good about who you are and that you could do something to change things. I would feel angry if I didn't do anything: If I wasn't aware, if I was trying to deny, if I had no opportunity. ... Anger will stifle you and stop you and make you so that you won't be able to move. ... I wouldn't allow anyone to do that to me. Because then they win, I lose. I want to win." Artist Faith Ringgold is best known for what she calls her story quilts; large canvasses she made in the 1980s in which she painted scenes of African-American life: sunbathing on the tar roof, a mother and her children, a quilting bee. She frames those canvases in strips of quilted fabric, carrying out an old African and African-American quilt-making tradition. The National Museum of Women in the Arts, in Washington, is showing an earlier aspect of Ringgold's art; big, strong, vivid paintings from the 1960s that reflect the violence and social upheaval of that time. Faith Ringgold, 83 now and stunning with her long braids and colorful beads, sat down at the Women's Museum not long ago to talk about those early canvases. I chose to sit here in front of that self-portrait that you made in 1965. I wish you would introduce us to that woman. She's beautiful and very determined, that's who I see in that picture. STAMBERG: Hmm. And what were they stopping you about? STAMBERG: ...because of your ideas about art? RINGGOLD: How about being a woman? RINGGOLD: So you had everybody saying that, women shouldn't X, Y or Z. Black people shouldn't X, Y or Z. There was a lot of people trying to get in my way and keep me from doing what I was doing. STAMBERG: ...because it was what a time this country. RINGGOLD: Well, I finally figured out exactly what I was supposed to be doing. I was looking for a gallery OK, to show my work. So I'm walking in all the galleries, I decided I'm going to Ruth White. Ruth White was a big gallery at that time. I've come to show her some work and she says to me: You can't do that. You're a black woman and you're painting landscapes? This is the middle of the '60s; all hell is breaking loose all over the country. STAMBERG: And she said you can't do that? RINGGOLD: You can't do that. RINGGOLD: And some people would've, might've been upset or hurt by it. But I was happy that she had the courage to tell me that. STAMBERG: So Faith Ringgold changed her work, gave up landscapes and began putting on her canvases the racial, political tumult of the '60s and the rage she often felt. In 1963, she began a series of 20 paintings called "The American People." RINGGOLD: White people, black people being shown in confrontations. There's an actual street riot called "Die." There's the flag is bleeding with blood dripping. It was what was going on in America, and I wanted them to look at these paintings and see themselves. Look and see yourself. I wanted to create art that people would stand and look. You've got to get them and hold them. And the more they look, the more they see. STAMBERG: She wanted them - us - to look at the realities of race in this country; the pain and brutality of it. But she found no ready audience. Ringgold says it's taken this long to get these tough paintings exhibited. Fifty years ago, she was showing, she thinks, too much. RINGGOLD: Too damn much. And you could get by very easily without saying quite so much. STAMBERG: Is that why you took up what you became known for, which were the quilts, the story quilts? I mean, it really made your reputation on those. RINGGOLD: And I was so shocked. I thought they wouldn't accept the paintings as quilts because they would say they're, what, crafts. However, it didn't get in my way. It really didn't. And I think that it had something to do with the fact that paintings people really don't understand. They don't understand how big - they don't really get paintings. Quilts, they do understand 'cause everybody has a quilt in their house. STAMBERG: And what do you think it was about that that opened the doors of the art world, really, for you and got people looking and knowing your name and knowing what you were doing? RINGGOLD: Yeah, 'cause that's what did it. STAMBERG: You think it was the comfort that we have all quilts? RINGGOLD: Yes. I think it had a lot to do with that. I think it had a lot to do that it was a familiar medium and people liked stories. They like them. Yes. I think I had struck on a combination of imagery and politics that worked and people said OK. Or maybe they said here she comes again. Let's see what this is. RINGGOLD: As far as I can see, I had no opposition from doing those story quilts. STAMBERG: These days, you're continuing to make children's books. You've had tremendous success with those. You've done something like 14. You're on some new project, and with your turning sudoku, which I find totally baffling, into images and art for iPhones and smartphones, etc. Is the anger still there with you, the anger that we see? I'm standing in this gallery and the paintings that surround us. Or has that moved on? Have you moved through that? RINGGOLD: I don't think it's anger. I think it's enlightenment. I think I'm aware of what is happening. I don't think you can create art out of anger. It has to come out of some form of understanding. You have to feel good about who you are and that you could do something to change things. I would feel angry if I didn't do anything. If I wasn't aware, if I was trying to deny, if I had no opportunity. So, I can't say that I was angry, 'cause anger would stifle you and stop you and make you so that you won't be able to move. STAMBERG: Anger takes away from that. It turns everything into one color. RINGGOLD: Yeah, right. And I wouldn't allow anybody to do that to me because then win, I lose. I want to win. STAMBERG: I think you did. I think you are. Thank you so much. RINGGOLD: Oh, goodie. OK. Thank you. 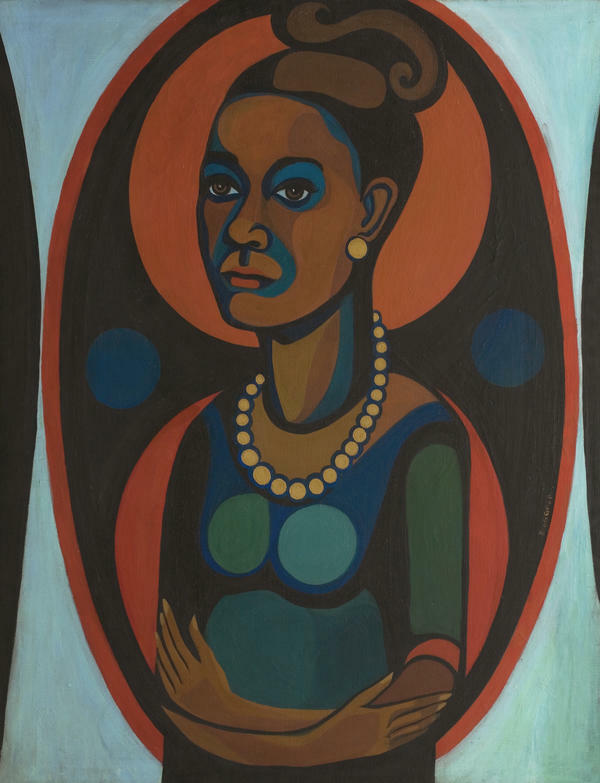 STAMBERG: Faith Ringgold's paintings from the 1960s at the National Museum of Women in the Arts in Washington until early November. You can see some of them at npr.org. STAMBERG: You're listening to WEEKEND EDITION from NPR News. Transcript provided by NPR, Copyright NPR.